November 8, 2017 November 14, 2018 Makayla @ makaylasophia.comLeave a Comment on Bookcase.club MEGA Unboxing! 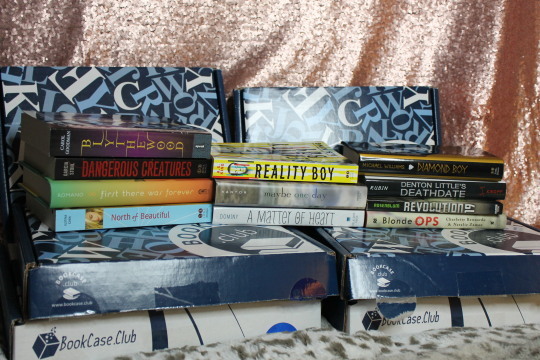 I’m super excited to share with you all the unboxing of SIX MONTHS worth of boxes from Bookcase.club, as well as tell you some more information about this amazing book subscription box company. 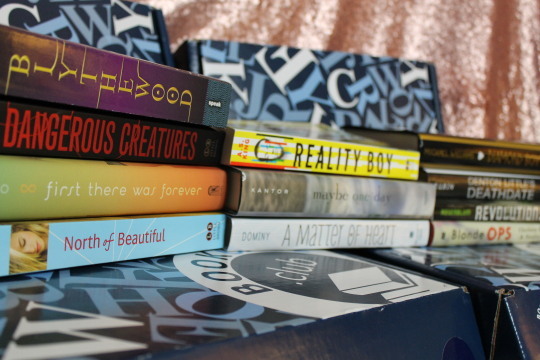 Bookcase.club is monthly subscription box that brings books to your door every month! At $9.99 a month + shipping, it’s a great deal. There’s a wide selection of genres to choose from, so you’ll always be reading something you enjoy. If you would prefer to view the video version of this post, it is available on my YouTube channel HERE. 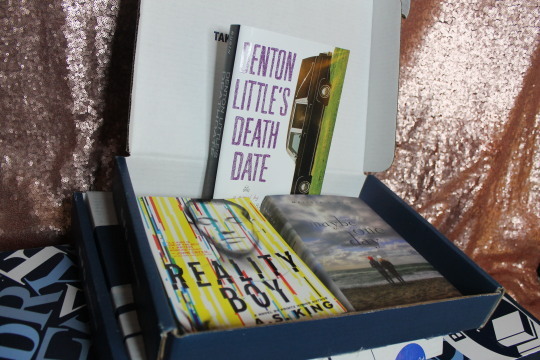 The books received in the first two boxes includes Denton Little’s Death Date by Lance Rubin, Reality Boy by A.S. King, and Maybe One Day by Melissa Kantor. Listed below are some descriptions and links for each of these. My favorite thing about Bookcase.Club is that I am always amazed by their selection of books. Each of the book descriptions are thanks to Goodreads. Even when she isn’t sure what to say. Even when Olivia misses months of school. Even when Zoe starts falling for Calvin, Olivia’s crush. 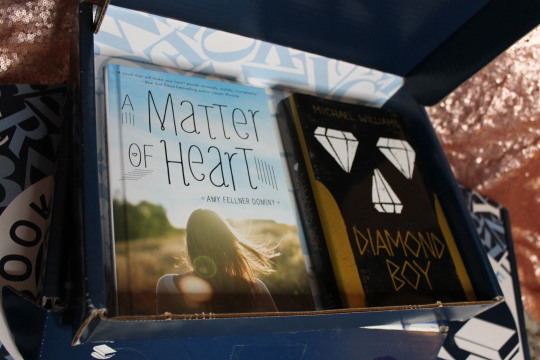 The next case included A Matter of Heart by Amy Fellner Dominy and Diamond Boy by Michael Williams. I was absolutely thrilled when I received the box. The packaging is beautiful, and I was immediately enthused by the books I saw. Both of the below descriptions are thanks to Goodreads. That’s what fifteen-year-old Patson Moyo hears when his family arrives in the Marange diamond fields. Soon Patson is working in the mines himself, hoping to find his girazi–the priceless stone that could change his life forever. But when the government’s soldiers comes to Marange, Patson’s world is shattered. The next book case includes two books. The first is North of Beautiful by Justina Chen and First There Was Forever by Juliana Romano. Both descriptions are thanks to Goodreads. Lima and Hailey have always been best friends: Lima shy and sensitive, Hailey funny and free-spirited. But Hailey abandons Lima to party with the popular kids and pursue Nate, her disinterested crush. As their friendship falters, Lima and Nate begin spending more time together. And before Lima knows what she’s feeling, she and Nate do something irreversible. Something that would hurt Hailey….if she knew it happened. The next box included two amazing books. 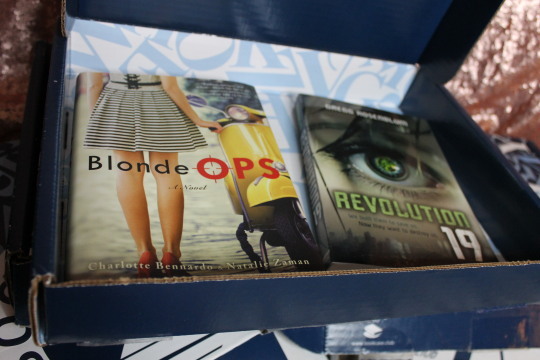 The first was Blonde Ops by Charlotte Bennardo and Natalie Zaman. The next was Revolution 19 by Greg Rosenblum. The last box I unboxed included another two spectacular books. 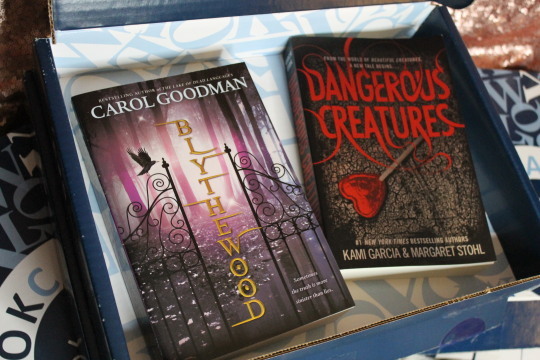 Blythewood by Carol Goodman and Dangerous Creatures by Kami Garcia and Margaret Stohl was included. I am always thrilled and pleased with the amazing books Bookcase.Club curates in their boxes. I always know when I receive one of their boxes I am in to read something amazing. I would like to. say a huge thank you to Bookcase.Club for sending me all of these boxes. And for my readers, all opinions are my own. I really am this amazed! Have you read any of the books seen or are you subscribed to Bookcase.Club? !